HOARFROST is a dark ambient / industrial project, created by Rafał K. in 2006, in Silesia, industrial region of Poland. Its first demo has been released by Kaos Ex-Machina netlabel in 2007. The first long-play CD by Hoarfrost and its official debut was “Ground zero”, released by Zoharum one year later. It is a story of a destruction of the concrete world, presented in a death industrial climate. “Decline” CD, which is an effect of collaboration with Inner Vision Laboratory, appeared in the same label in 2010, is much more melodic, but still psychodelic. Extreme vocals enriched Hoarfrost ’s music thaks to Hekte Zaren, vocalist, who join the project, during the works on “Puppets of divine coroner”. The album released on December 2011, also by Zoharum. In meantime Hoarfrost published a 3 CDr and DVD “Last message… unknown”, which include music from one of a few concerts, played in Ireland. Hoarfrost has also taken part in many compilations, published by European labels. Music of this project is a description of landscape developing from an unknown cataclysm. It tells about ghosts, maundering through the ruins of destroyed cities. It is also the story about man, who became a prisoner of the reality, created by himself. Interview (2016 11 02). You worked with a plethora of artists over the years. What collaborations were/are the most interesting and important to You and why? Hello. It is difficult to point, which of them were the most important. I try to take part in this projects/collaborations, which have working on my imagination from the beginning. Each of musicians should bring to the project an element characteristic of his or her artistic output. In effect of such music meeting, the album could become something unique. Until now I have a pleasure to collaborate with great musicians and during the working with each of them, I have became enriched by new experiences. It also impact on my present works. Can You tell me, in short the main ideas are behind Your music? The music of Hoarfrost is the world of visions, the apocalyptic landscapes, full of ruins. It is a world seemingly dead but in fact full of emotions. Hoarfost is asking the questions and looking for the answers with the listener. Could You name Your favorite Your compositions / albums / collaborations? I listen to much various music. It is difficult to point something concrete. Each of mood and each of the day has its own music. Death metal, punk, sung poetry. If something intrigue me, I listen to it. But I am demanding. What about the new album? What’s its concept? 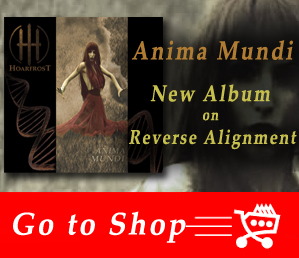 The new album of Hoarfrost „Anima Mundi” has released August 17th, 2016, by Swedish label Reverse Alignment. It is a sad album, it is considering, if on planet Earth we are the children of a good mother like mythical Gaia or other mithical figure – Medea, which has killed her children. I have to explain, that we have been creating the album in specific conditions. Many great musicians, appears on it. There is the cellist Kasia Bromirska from Percival Schuttenbach, guitarist Valdi Rzeszut from Ratatam, Dawid Chrapla and Tomek Twardawa, the legends of Polish noise scene. Amellia, the photographer, which take pictures for the covers of Hoarfrost albums, died in the beginning of the realisation of the material. We have decided to dedicate her the album. The sound is magic. You‘ve proved it. But, what ends, when there‘s no sound? The sound and the silence are coexisting from the beginning and they are inseparable. There would be no sound without the silence. The silence in the same way as the sound are building emotions and sometimes the silent speaks better than the sound. What is and what is not a Sound Art to You? Your songs are so strong and sincere, especially in the new album, Anima Mundi. The notion of the art is wide and everybody understand it in different way. The best example is the ambient industrial music, which Hoarfrost creates. The music or, generally, the art are the emotions, the message from the artist. The receivers are on the other side. If something that they can hear or see, fire up their emotions, we could talk about the art. The sensibility and reception of the artistic message are different for each person, as well as perception of the sound. The sounds which are a noise from one person, for other will be an aritistic vision, boosting them to action. Everybody has to find sounds or emotions proper to him or her. What do You think about relations between the old art and computer art? Are they compatible? Nowadays the computers are present on each period of creating. It is a next instrument in the human hands and I treat it just like this. There is only important, what we would like to and could reach. Many persons, especially from the older generation, think that using a computer is an evidence of the musical illiteracy. But we should remember, that the computer without the man can do nothing. The compositions don’t arise by push one button, like some people think. The years of practice and primarily the talent are necessary to make a good music, no matter if you are using an instument or a computer. The computer allow the quick and comfortable work. Every aspect of sound editing is nowadays such a complicated process, demanding detailed knowledge and skills. There is visible the narrow specialization in the field of realisation or mastering the music. But the most important is always the man and the vision of artist, not the tool, he is using. What Lithuanian and foreign musicians do You value most? I know a few metal groups from Your country: Žalvarinis, Katedra and a few more. The Sslavic spirit is hearable in their music. But You are from a Slavic land, Poland. Its metal scene is famous. What about dark music/dark ambient/industrial scenes of Poland? It is difficult to compare the metal scene and the ambient scene anywhere in the world. Metal music will be always more popular and mediumistic. Ambient industrial is niche music, dedicated to the specific group of the listeners, so its popularity is quite lower. It is true that we have in Poland many good metal bands, known on all the world and from time to time next groups join to this elite. The ambient industrial scene also do well and many Polish projects have European or world standard. In the internet times, borders haven’t meaning. Many things are my inspiration. Sometimes it is a literature, sometimes a music, sometimes both. The world is full of stimuli. Everyday we are bombed by informations, which are more or less important, so sometimes the most inspiring is just a silence. The mind which let making the choices in my life.